Intense two days of presentations, meetings, and networking at Las Vegas and all that under the Adobe hat. And an awesome pre-conference training. And a great breakfast! 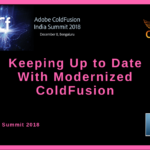 From November 15-17 2017 Adobe organized its yearly conference with the main topic ColdFusion. We took enough time to track down and put together a nice list of 13+ useful resources and slides from the speakers. Let's dive into it right away. Brad covered the generic JSON format that's used and talked about how you can distribute your code with a full generic set of configuration including CF mappings, datasources, custom tags, or request timeouts without needing to worry about what version of CF the end user is going to have. 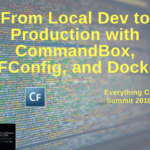 This tool is a must for anyone using Vagrant, Docker, local development environments, or just managing more than one server. 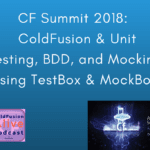 ColdFusion veteran as everyone knows Charlie talked about moving up to CF2016, or 11-> In doing so, are you skipping over 11, or perhaps even 10, in that move? It addresses the compelling reasons — including legal — for applying Accessibility to digital documentation: Word, PDF, PowerPoint, and Web. Examples of poor Accessibility are presented with illustrations of the resulting effects for users with disabilities. And, it's covering strategies and solutions. See how FusionReactor goes beyond just “monitoring” to deliver more depth & insight to your production applications and servers – both on premise and (now) in the cloud. Targeting intermediate level of developers this presentation shows ideas for the use of the framework as well as demonstrate commonly used functions. Don't get stuck back in 2005! Learn how easy is to securely share confidential information within and outside your organization with controlled access and permissions. 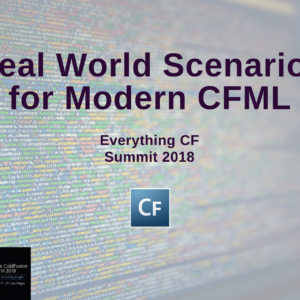 Tips to take that legacy CFML site and make it more modern. 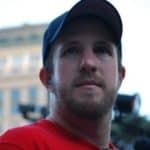 Dan went over some thoughts on what to look for in a legacy site which can help you determine if you should refactor or not. Direct explanations that can be incorporated immediately into your daily development, without all of the overly technical DBA mumbo-jumbo. Regardless of your skill level or programming language of choice, if you use SQL Server this session is for you. Pete did another full day training on Writing Secure CFML for the pre-conference. It was sold out at 50 seats and was a lot of fun to present. The demo code for that session can be found here: github.com/foundeo/cfml-security-training. Stay tuned as we will be updating the list in the next few days. 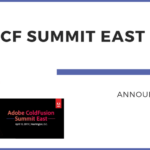 Some of the material and info about the speakers and their presentations were picked directly from Adobe CFSummit website and we thank them for that.